Jakarta is the capital of Indonesia and the most populous city in the country, and home to approximately 10 million people. This metropolis, with more than 170 shopping malls and constant traffic, has been the nation's political, economic and cultural hub since its foundation in the 17th century. The city is considered a melting pot of cultures, where the traditions of many nations (European, Chinese, Arab, etc.) meet with those of various Indonesian ethnic groups (among them Javanese and Sundanese). And regardless of its rich history and colonial heritage, Jakarta receives less than 20% of all visitors annually arriving to Indonesia. Those who decide to include it on their itinerary, end up staying on average two days in the city, often using it as a gateway to other more popular destinations, such as Bali, or just visiting on business. 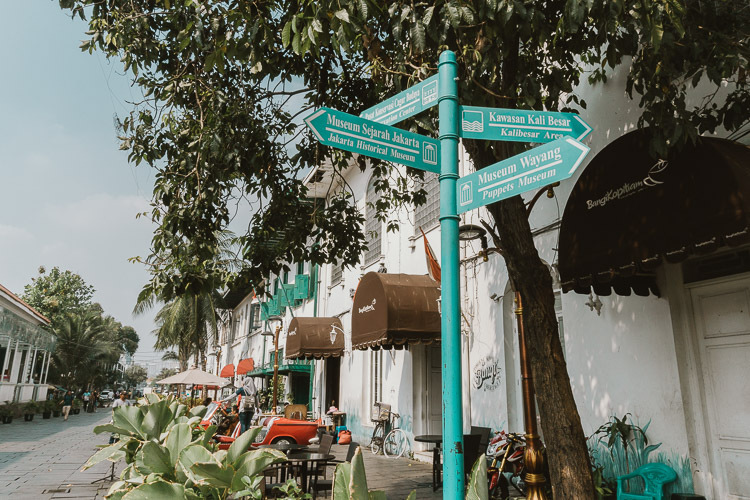 If you plan to spend two days in this city and explore what it has to offer, see below a detailed itinerary to take advantage of the best of Jakarta. Start the day at the imposing Arjuna Monument, which is located in a roundabout between the main avenues of Jakarta. The statue depicts the final war scene of the classic Indian epic Mahabharata, where a chariot is drawn by 11 horses and directed by Krishna, one of the incarnations of the god Vishnu, with Arjuna holding a bow and arrow. Continue with a 400-meter walk to the National Museum (open Tuesday to Friday from 8 am to 4 pm, weekends from 8 am to 5 pm; entrance at 10,000 IDR). The museum began as a private collection in 1778 and in 1868 was transferred to the current building. It holds more than 100,000 artifacts from all over the Indonesian archipelago and is one of the largest of its kind in Southeast Asia. Guided tours in English are offered free of charge on Tuesdays, Wednesdays, Thursdays and Saturdays at 10 am; and also at 1:30 pm on Thursdays. For guided tours in other languages, contact the Indonesian Heritage Society. Leaving the National Museum, walk for about 15 minutes to the National Monument, known as Monas. The imposing 132-meter-high obelisk is made of Italian marble and features a bright flame at the top covered with 50 pounds of gold leaves. The Monas is the symbol of the independence and strength of the country in the struggle to become independent. Here, you can see the original declaration of independence and climb to the top where you have a panoramic view of the center of Jakarta. The monument can be seen all day, however it is only open from 8 am to 3 pm if you want to enter the obelisk and go to the top; tickets for 15,000 IDR. From Monas, take a walk through the surrounding park and see the Pangeran Diponegoro monument. Prince Diponegoro is one of the national heroes and played a significant role in the Java war; leading an army to try to liberate the island from Dutch colonial rule in the early 19th century. When hunger strikes, you can choose to dine at one of the warungs (food stands) around the park, or try Indonesian cuisine at the Dapur Babah Elite restaurant. After enjoying the local food, if you still have energy, carry on another 500 meters to get to Istiqlal Mosque and see its facilities. It is the largest mosque in Southeast Asia, with capacity to occupy up to 200,000 people in its 9.5 hectares. Admission is free, but it is recommended to leave a donation for the guide that gives you the tour. And since you are there, in front of the mosque is the National Cathedral, which can be visited free of charge; it was inaugurated in 1900 and displays the European neo-Gothic style. The location of the Mosque and the Cathedral, facing each other, is not a simple coincidence; the first president of Indonesia placed them together as a symbol of the country's religious diversity, where all religions can coexist in peace and harmony. In Jakarta, I see the religious pluralism of Indonesia being accepted peacefully, since religions are not constantly fighting and imposing rules on each other, as in other nations. When evening falls, choose one of the restaurants in the Menteng area, still in the center of Jakarta, for dinner. The options are: Kaum, from the Potato Head group, famous for its trendy developments; Plataran Menteng, the famous hotel chain in Indonesia; Lara Djonggrang, which offers flavors of the Indonesian archipelago and is located in an old and beautiful Dutch mansion; Tugu Kunstkring Paleis, for an Indonesian meal in a historic building of the 20th century; and Seribu Rasa, which offers Indonesian and other Asian options. And if after dinner you still have a few drinks, go to the Skye Bar, which offers a good view of the city from the 56th floor of the BCA building. 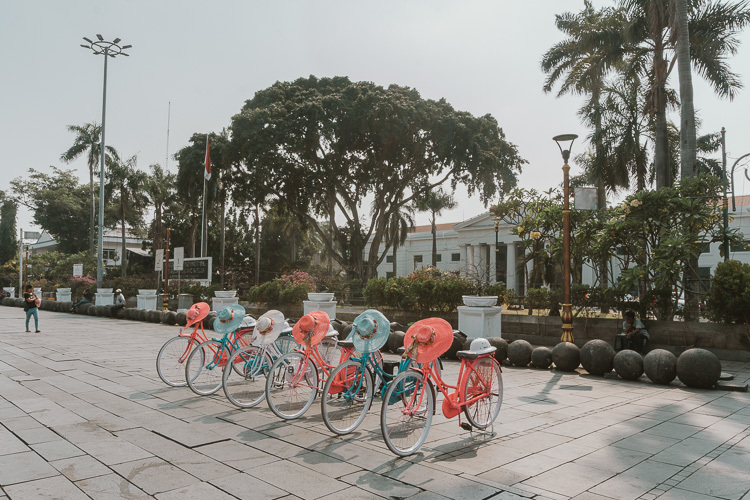 On the second day, head towards Kota Tua, or Old Batavia; the name given to Jakarta by the Dutch during the occupation period of the Dutch East India Company (VOC). The square, called Fatahillah Square, was the Dutch administrative center and heart of the area. 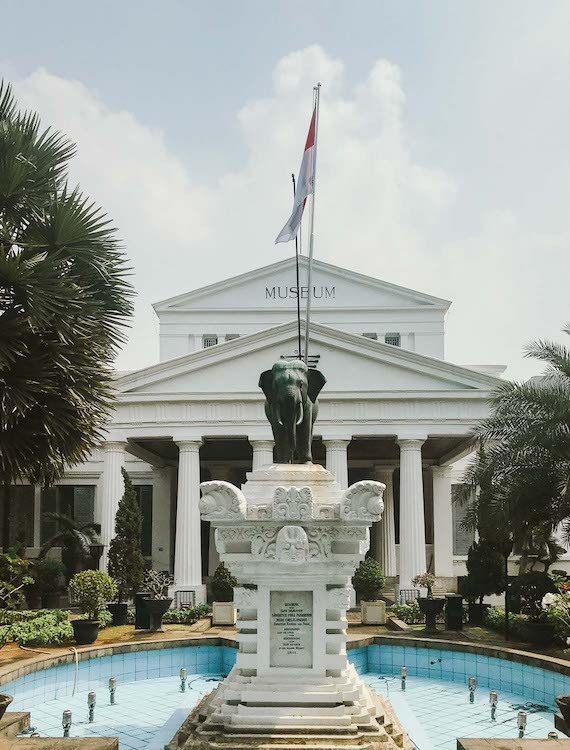 To learn more about the history of Jakarta, visit the Fatahillah Museum (Jakarta History Museum –Tuesday to Sunday from 8 am to 5 pm, for 5,000 IDR), which is located in the old city hall building. There you will have access to the objects currently exposed from the collection of more than 20,000 artifacts of the museum, among them VOC pieces, maps, paintings, etc. Another museum in the area that deserves to be visited is the Wayang Museum (Tuesday to Sunday from 8 am to 5 pm, entrance at 5,000 IDR), which is in the building of an old church and houses the puppets used for the puppet theater presentations, which is one of the most famous demonstrations in Java and the whole Indonesia (Wayang is considered Oral and Intangible Heritage of Humanity by UNESCO). Continuing along Fatahillah Square, visit the Fine Art and Ceramic Museum (Tuesdays to Sundays, from 8 am to 5 pm, entrance at 5,000 IDR). It is located in the building of the former Court of Justice and has approximately 400 artifacts, among them paintings by renowned Indonesian artists and ceramics from various parts of Asia. When it's time for lunch, head to the classic Café Batavia . The restaurant is set in a building from the 1830s and displays a colonial ambiance that transports you back to past centuries. On the second floor, you will find large windows with direct views of Fatahillah Square; ask for a table next to them and see the people on the square using colorful bikes and watch the comings and goings of tourists and locals. But keep in mind that to get a table by the window, you will need to consume food and drinks. 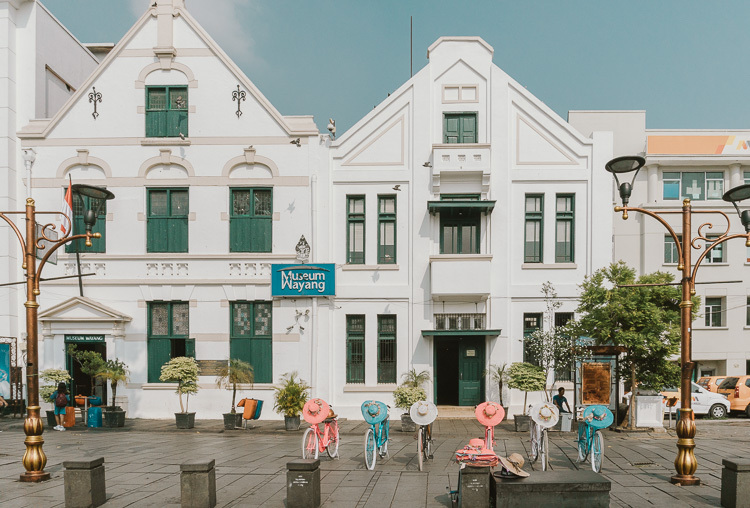 In the afternoon, if you want to see more traces of the Dutch period in Jakarta, head north (in a motor vehicle) to the main port of Sunda Kelapa. 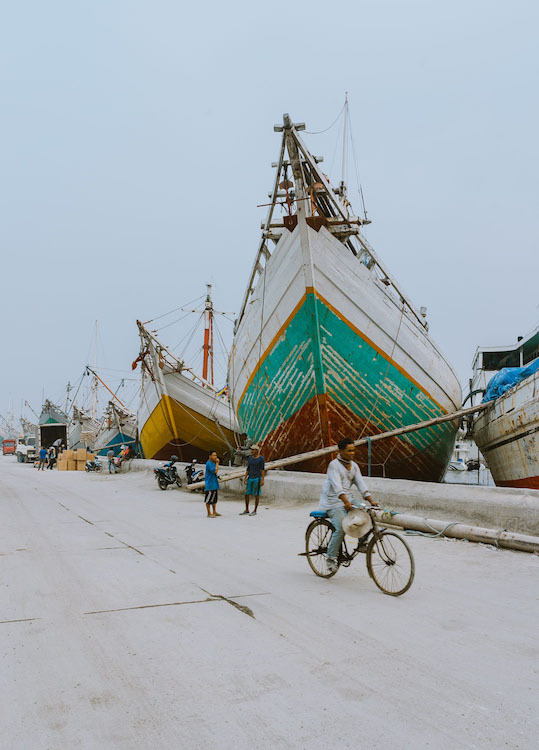 It was the place where the ships were anchored and to this day you can still find the legendary phinisi schooners (traditional Indonesian sailboat which is also Oral and Intangible Heritage of Humanity by UNESCO). The original VOC warehouses in the region were transformed into the Maritime Museum (Tuesday to Sunday from 8 am to 4 pm, 5,000 IDR). Other finds in the region are the harbor's captain's tower, where ships had to pay excise duty, as well as a typical Dutch drawbridge. However, if, after visiting Kota Tua, you are tired of staying in the heat outside, visit one of the largest shopping malls in the area, Grand Indonesia. Take some time here to see how the locals spend their days and enjoy the gift of air-conditioning. In the evening, choose one of the restaurants suggested for the previous day; and - why not? - finish your stay with a session at your hotel's spa. Download the Go-Jek and Grab applications, which work like Uber. With the Go-Jek app you can choose between Go-Bluebird, for taxis that use taximeter, or Go-Car, for common cars and fixed price travel. Grab is another application from Malaysia and Singapore that bought Uber in Southeast Asia (the price of the ride is also fixed). You will need internet to use the applications above, and if you don’t have roaming enabled, buy a data SIM card from Telkomsel or XL at the airport. The cost is around 100,000 IDR. To enjoy the above itinerary, the best area to stay is Menteng and the hotels below are the best ones. A historic hotel and the first 5-star hotel of Indonesia. It was opened in 1962 by the first president of the country in a strategic location, right in the center of Jakarta, close to several malls and overlooking the circle with the Welcome Fountain. Another 5-star hotel option, the Mandarin is also located in the center of Jakarta, opposite to the Kempinski, and is also an excellent option to enjoy this itinerary. Shangri-la Jakarta is one of the best hotels in the famous Asian chain. It is located next to the Grand Indonesia shopping mall, has 7 restaurants, an extensive swimming pool and the hotel's spa is one of the most wanted in the city, running until 11 pm. I believe Jakarta is an excellent city to visit one of the 5 star hotels above, since they are considerably more affordable than in other destinations. But other economical and strategically located options are: Holiday Inn Express (starting at US$ 55), Four Points by Sheraton (starting at US$ 55) and All Seasons Hotel (starting at US$ 60). Always carry cash. Many places can either have problems with credit cards or have a minimum charge amount. In Jakarta, more than 80% of the population is Muslim, but still you can wear whatever you want, just be respectful. Be prepared to interact with locals, especially in Kota Tua where you will have your minutes of fame when they ask to take pictures with you.When leaving Jakarta, go to the airport early. Although the hotels above are only 30 kilometers away, the journey there can easily take 3 hours.